It almost seems a little late to be doing a spring wildflower article, but I’m reminded that it really is still early spring when I walk in the woods around central Wisconsin. There is something wonderful about seeing the color, sometimes poking through the snow. The green of spring is refreshing, but the yellow of the marsh marigolds celebrates the coming warm sun. Even better, some of these early spring plants provide a tasty treat as we get ready to plant and harvest our own gardens. 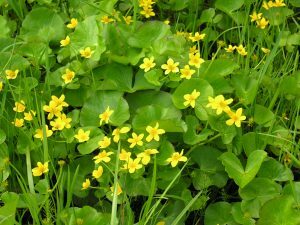 One of the earliest to show its bright flowers is the marsh marigold (Caltha palustris), which starts to flower in April. As its name suggests, it is found in wet areas. I usually see these plants on early spring bike rides along the road in sunny, wet ditches. The name is deceiving as it isn’t related to marigolds, rather buttercups. The leaves are edible when boiled several times, and the roots have medicinal uses. Trout lily (Erythronium americanum) leaves are some of the easiest to identify in the spring. The pairs of leaves are green with brown mottling, similar to the color of trout. The singular flowers are yellow and nodding, with brown specs. In cloudy weather the flowers are droopy, but when the sun comes out, the petals curl back. 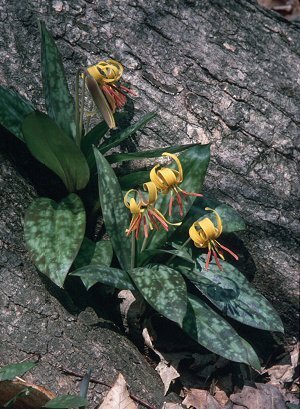 Trout lily are found in rich forest soils, and prefer shade. These have been flowering the last few weeks around Wausau. The leaves, flowers and bulbs are edible, though the leaves and flowers are rather bitter. In very early spring, just after the ground thaws, the raw bulbs are said to be comparable to sweet corn. Fawn lily (Erythronium albidum)is very similar to trout lily, but with white flowers. One of my favorite species to forage for in the spring is the wild leek (Allium tricoccum). These plants also have paired green leaves, similar to the trout lily, but without the brown mottling. 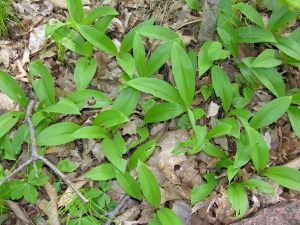 The leaves start to appear in early spring in rich, moist woods, but I usually wait a few weeks before I harvest the prized part, the bulbs. Both the bulbs and leaves can be eaten, and have a mild onion flavor. This one doesn’t flower until June or July (a similar white cluster of flowers as other alliums), but the leaves are the most exciting part for me. The third spring wildflower in the lily family (along with trout lily and wild leek) is the big white trillium (Trillium grandiflorum)and nodding trillium (Trillium cernuum). I mention both because, well, I love the carpets of both kinds of trillium we find around here. These leaves are pretty distinct as well; 3 large oval or diamond shaped leaves in a whorl. Both have large white flowers. Nodding trillium is found in wetter soils, while big white trillium prefers dry to moist soils. 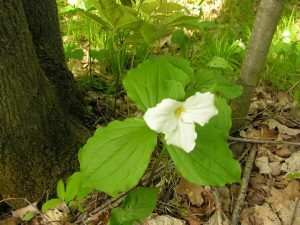 Of the two, only the big white trillium has a rootstock that is used for medicinal purposes. This past weekend I was in the southern part of the state, and came across one of my favorite flowers, wild columbine (Aquilegia canadensis). There is something beautiful about the way the delicate flowers hang. The plants are found in dry soils (sandy or loamy), and like both sun and shade. 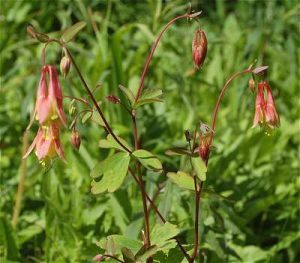 Wild columbine is also in the buttercup family, but this one shouldn’t be eaten. There are a number of good wildflower field guides. However, a good online resource, if you want to see what should be blooming each month, is the UW- Stevens Point herbarium site. If you are interested in reading more about edible wild plants, check out Sam Thayer’sNature’s Gardenor the Peterson Field GuideEdible Wild Plants.